NAHB’s analysis of Census Data from the Quarterly Starts and Completions by Purpose and Design survey indicates that the number of custom home building starts (homes built on an owner’s land, with either the owner or a builder acting as the general contractor) posted a slight decline on a year-over year basis from 27,000 starts at the beginning of 2014 to 26,000 starts for the first quarter of 2015. Note that this definition of custom home building does not include homes intended for sale, so this analysis uses a narrow definition of the sector. As measured on a one-year moving average, the market share of custom home building in terms of total single-family starts is now 24.3%, down from a cycle high of 31.5% set during the second quarter of 2009. The onset of the housing crisis and the Great Recession interrupted a 15-year long trend away from homes built on the eventual owner’s land. As housing production slowed in 2006 and 2007, the market share of this not-for-sale new housing increased as the number of starts declined. The share increased because the credit crunch made it more difficult for builders to obtain AD&C credit, thus producing relatively greater production declines of for-sale single-family housing. 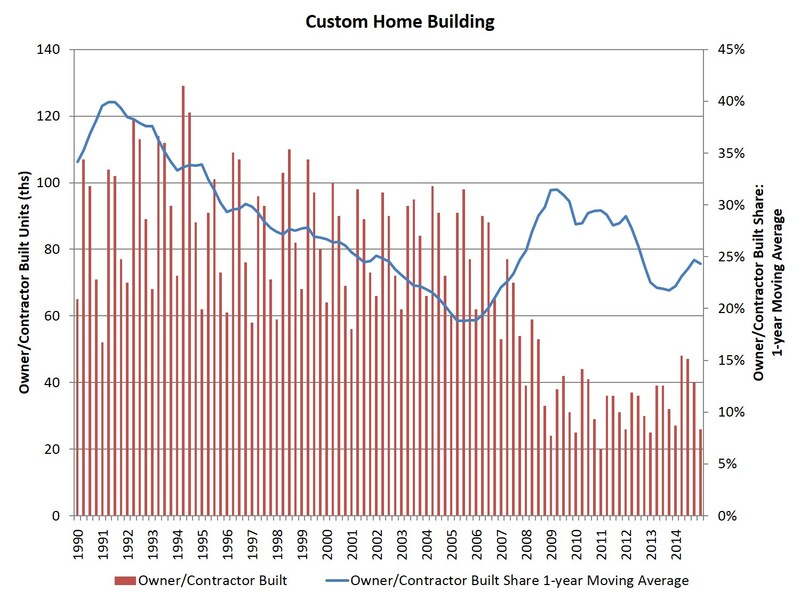 The market share for custom home building will likely experience ups and downs in the quarters ahead as the overall single-family construction market expands.